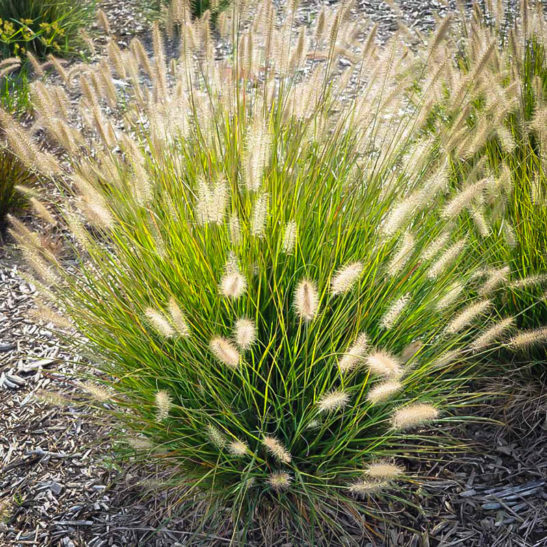 Of all the ornamental grasses available, Fountain Grass is a ‘must-have’ popular with gardeners at every level. This reliable grass forms a fountain of narrow green leaves and flower spikes with pinkish bottle-brush ends. These turn attractive beige and golden colors in fall. This grass is attractive from late spring well into winter, and only needs one trim a year to grow perfectly. It is hardy from zone 5 to zone 9, so it can be grown across almost all the country. Use it with small shrubs and perennial flowers, as specimens or in groups. Plant it in drifts among other plants or create informal hedges with it. Use it to edge beds, paths and driveways. Plant it in containers, planter boxes and pots, where it will look spectacular alone or mixed with other flowers. No matter how you grow it, you will love this grass. Plant Fountain Grass in any sunny location. It will tolerate some light shade too. It grows in any well-drained soil, flourishing even in poor soils. 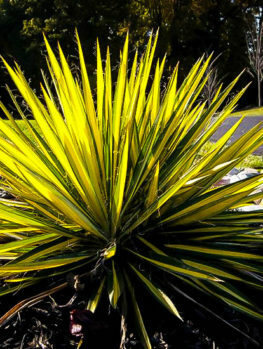 Once established it is drought resistant and grows with almost no care at all needed. In late winter or early spring cut back to 3 or 4 inches tall. It needs a least 2 weeks of warm weather for this grass to re-sprout in spring, but it will soon do so, and quickly fill out to be a beautiful presence in any garden. It normally has no pests or diseases and deer usually do not eat it. 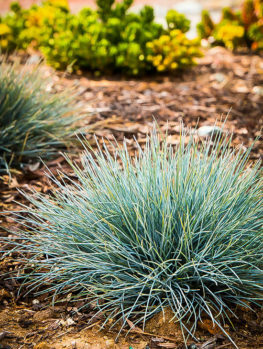 For an easy-care plant of great beauty, you can’t beat Fountain Grass. 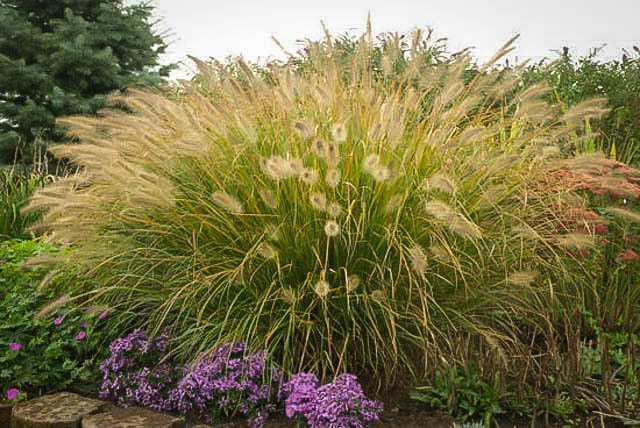 Of all the ornamental grasses, there is one that always draws attention and praise from everyone who sees it. This is Fountain Grass, an easily grown grass of striking beauty. 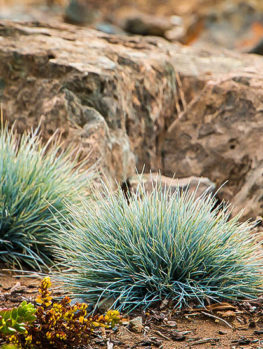 If you are new to ornamental grasses, this is where you should start. If you are experienced with them, you already know this is one you can never be without. Fountain Grass grows reliably in almost every garden, and it makes a wonderful show for months and months. Fountain Grass (Pennisetum alopecuroides) is native to parts of southern Asia, Japan and Australia, where it grows naturally in grassy areas. It is an upright clump-forming grass with narrow, upright leaves that arch over, with many leaves forming a clump, creating a fountain-like effect. The leaves are less than ½ an inch wide, mid-green in color and 2 to 4 feet long. 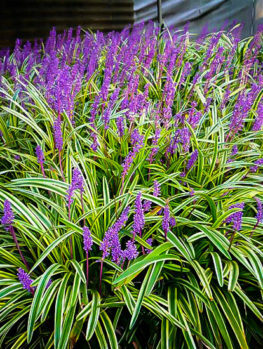 Typically this grass grows into mounds of arching foliage, with many seed stalks rising above the foliage, creating a wonderful effect that you will love. It sways gracefully in every breeze, yet it stands up even to strong winds in open, windswept places. 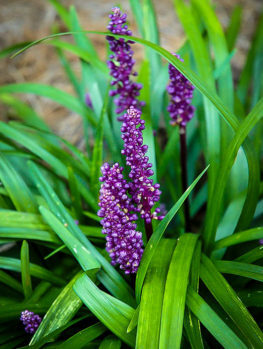 Overall this plant will be 2 to 3 feet tall and the same across, but under ideal growing conditions older plants can be a foot taller when in flower. From within the foliage flower stems will emerge by mid-summer, and last right into winter. These have fluffy ends like a bottle-brush, and it is these many flower heads sprouting upwards and outwards that create the fountain effect that makes this plant so outstanding. The heads begin silvery beige in color, with a pink flush, turning lighter as the seeds mature. Then they turn pale straw colored in fall. These seed spikes can be cut at any time for floral arrangements, and they can be hung upside down to dry for long-term indoor display in winter. 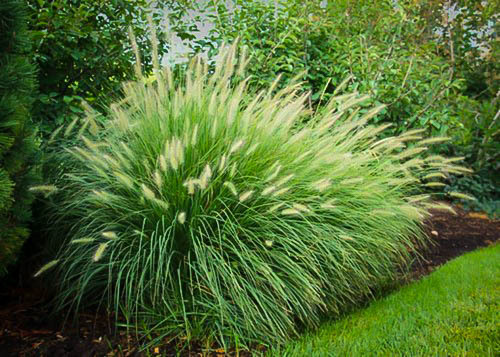 You can use Fountain Grass virtually anywhere in your garden. Plant it as single plants or groups among other flowering plants, or with other kinds of grasses. Use it in a row to edge a bed of large shrubs. Make an informal hedge by planting it in a row, dividing one part of your garden from another. 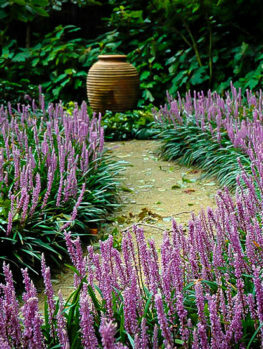 Plant along a pathway or driveway to create a lovely effect. Space plants in rows or groups between 2 and 3 feet apart, depending on the effect you want to create. This plant also does well in planter boxes, containers and pots. Make sure they have drainage holes and water regularly, letting the soil become moderately dry between each watering. Use a liquid fertilizer recommended for foliage-plants while your new plants become established. Fountain Grass loves the sun, and it thrives in hot sunny places. It grows well in any well-drained soil, and it is untroubled by poor soils. 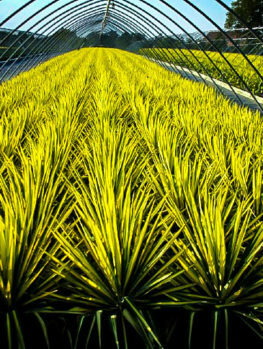 Part of the reason for the popularity of this plant is how easy it is to grow almost anywhere. It is fast growing, and the plant you put into the ground in spring or early summer will quickly become a full-sized plant by fall. Some fertilizer will help plants in the garden become established quickly, but it is not really necessary in ordinary garden soil. Water regularly when first planted, but once established plants are drought-resistant and only need water if the soil becomes very dry. Do not over-water. This plant is normally free of pests or diseases, and deer usually leave it alone. This plant is hardy from zone 5 to zone 9. It may survive in colder zones in well-drained soil, but that depends on local conditions and the kind of winter you have. Since plants grow large in a single season, in colder areas it is often treated as an annual plant. In late winter or early spring cut back the foliage to a few inches tall. This grass is slow to re-sprout in spring, and it needs at least 2 weeks of warm weather before new growth is seen. Once growth begins it is rapid, and plants quickly fill out. 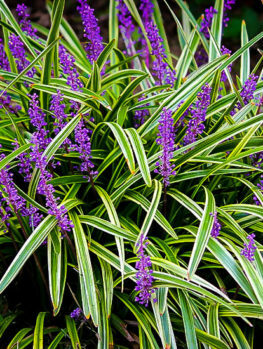 This cutting back is the only maintenance needed – a very easy plant to grow and care for.